This is a 36mm. 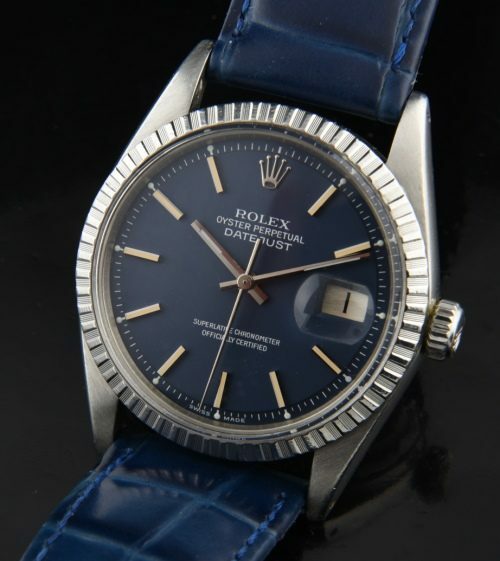 stainless steel 1977 reference 1603 ROLEX DATEJUST having a spectacularly attractive “blue jean” blue dial and steel crenelated bezel. The steel case looks fantastic and has not been over-polished. The automatic winding ROLEX movement was just cleaned and is accurate. I have to say, this look of this dial made me want to hang on to this watch! Coloured dials are becoming harder to find these days. Don’t miss this one These are the NEXT investment grade ROLEX watches. $3495.